We’re going to use that word again; that word that is probably the most commonly used word for business printers – workhorse. 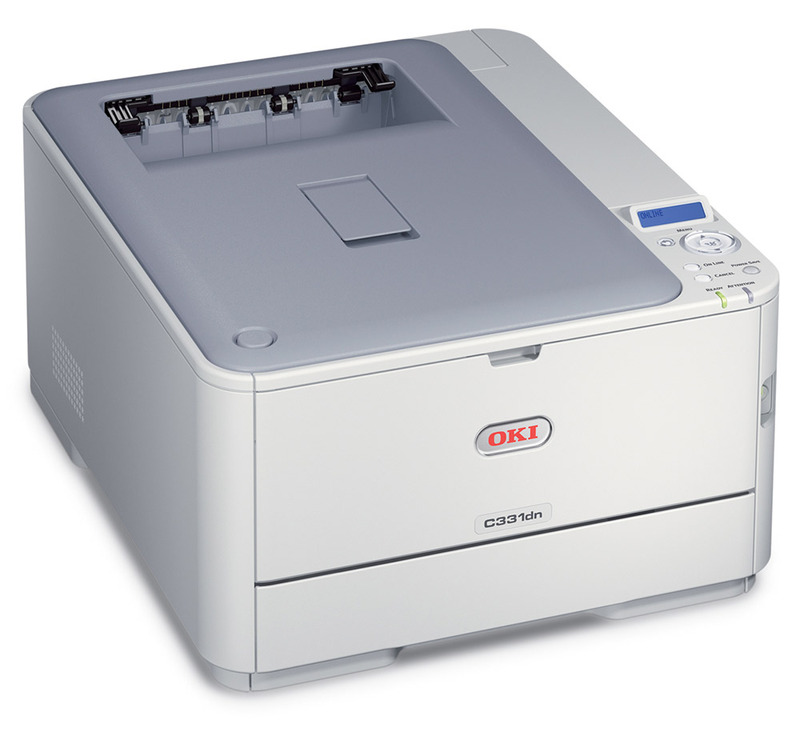 The Oki C531DN, indeed, has the capability to be a workhorse for your office or business. It certainly has all the right attributes for it. 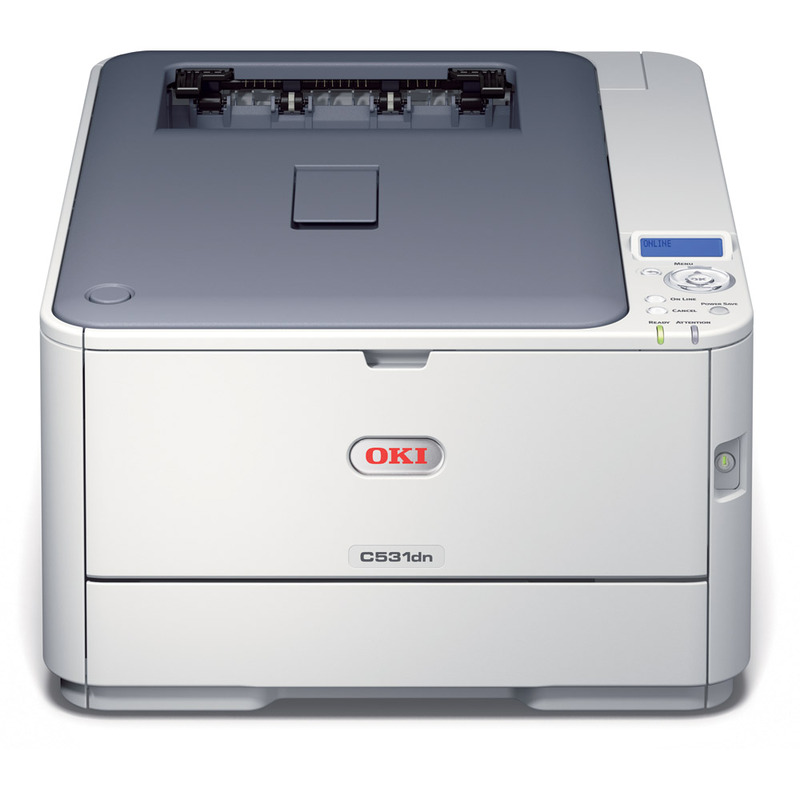 It is also important to add that the Oki C531DN colour laser printer is the elder cousin of another printer from the same Original Equipment Manufacturer (OEM) that we’ve already reviewed – Oki C331DN. Owing to their brotherly association, it isn’t all that surprising that the strengths and weaknesses of the Oki C531DN are quite similar to that of its younger cousin. 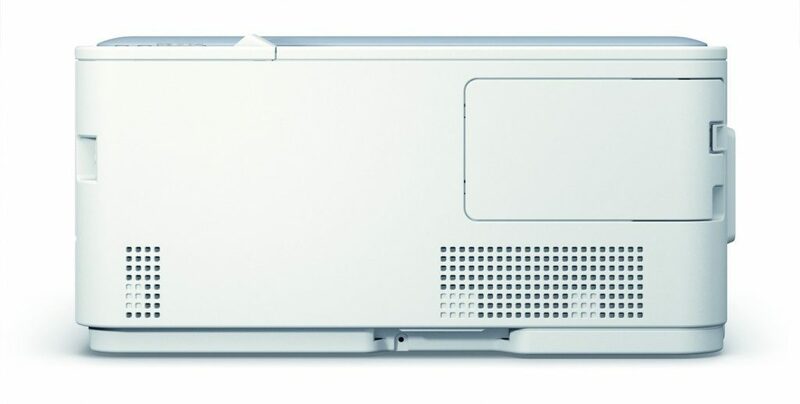 The qualities of the Oki C531DN are the same as the Oki C331DN i.e. good paper handling and decent speeds. Similarly, the weaknesses are shared. The biggest difference between the elder and the younger cousin is that the former is capable of handling much heavier use than the latter. Here’s our Oki C531DN review. The Oki C531DN is an LED printer. Even though LED printers are technically classed under the laser category, they are technologically different from the more conventional laser printers. In LED printers, LEDs are used in place of lasers to draw the image of the document that needs to be printed. Since LEDs consume less energy than conventional lasers and are more durable to boot, LED based colour printers tend to be more reliable and less damaging to the pocket. This can definitely be seen as a positive aspect of the Oki C531DN. However, the real draw of the Oki C531DN for many business owners and office managers will be its paper handling. The Oki C531DN is very accomplished in the arena of paper handling. The printer comes standard with a paper drawer capable of carrying 250 sheets and a multipurpose tray that is capable of carrying 100 sheets. Therefore, the standard configuration of the Oki C531DN means that you’ll get a total paper capacity of up to 350 sheets. If this seems too small to you, then consider the fact that the standard configuration also includes an automatic duplexer, which should, in effect, double your total paper capacity. If even that is too low for your printing hungry office, then maybe the optional 530 sheet paper tray will meet your requirements. Adding this optional tray will take the total paper capacity of this printer to 880 sheets. 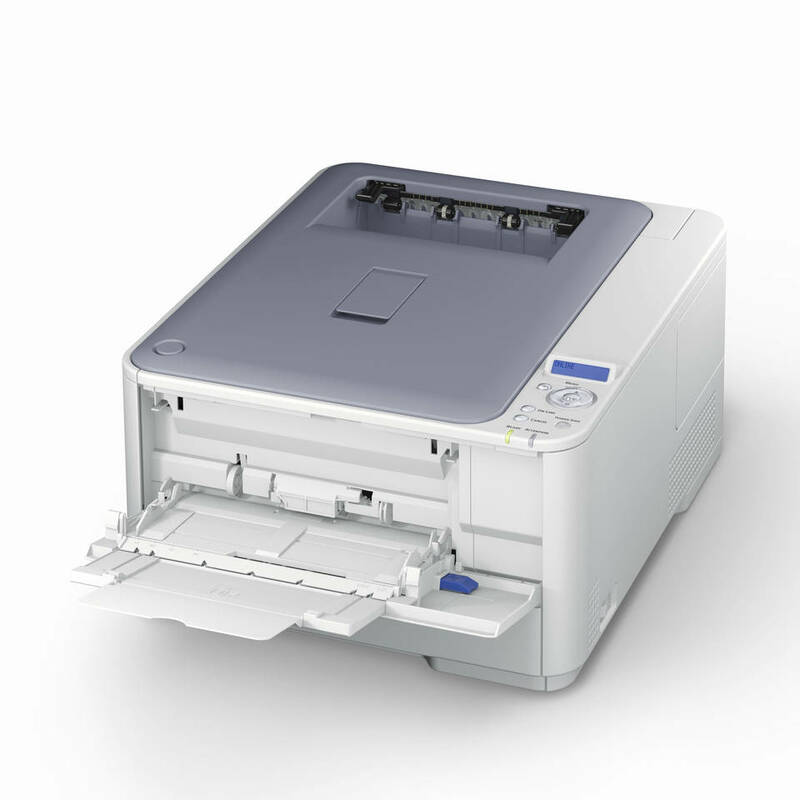 Another attractive quality of the Oki C531DN is that it accepts a wide array of paper types. This printer can handle index cards measuring 76.2mm x 127mm index cards, envelopes of various sizes, legal sized sheets, and even 215.9mm wide banners as long as 1320.8mm. Paper handling is only one side of a workhorse printer. For a printer to be considered suitable for high volumes, it also needs to exhibit good printing speeds. The Oki C531DN does that well with ratings of 30 pages per minute (ppm) for monochrome prints and 26 ppm for colour prints. If you use its automatic duplexing feature, then your printing speed will be to the tune of 13.3 ppm. All this speed makes this printer much faster than its younger cousin Oki C331DN. One more quality that the Oki C531DN shares with the C331DN is its compactness. The compactness, here, means that the C531DN is squat, short, but deep. Like the C331DN, this printer measures round about 241mm x 409mm x 503mm. 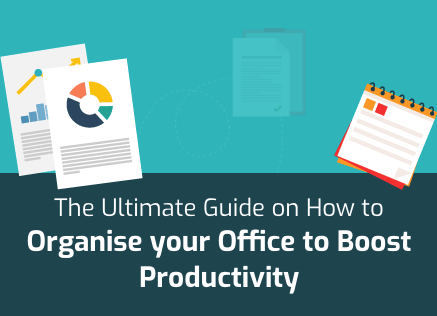 These dimensions, however, will change if you opt for the additional paper tray. The short and deep dimensions of this printer mean that you can easily place it on a standard office desk along with your computer. Furthermore, the Oki C531DN boasts a fairly advanced software system behind its control panel that offers up a number of management options and features. These range from everything within the security and tracking areas to even cost management aspects. The biggest limitation of the Oki C531DN is that it doesn’t support Wi-Fi direct like most modern day printers do. This limitation, if you remember, was there in the C331DN as well. If you plan to do a lot of mobile printing, then you will do well to avoid this printer as well as its younger brother. However, if your primary needs pertain to desktops and laptops, then you shouldn’t have any issues with the Oki C531DN. You should also avoid the Oki C531DN, if you expect a lot of photo and graphics printing. Like all workhorses, the C531DN isn’t meant to be a high quality graphics and image printer. If you want top end image and graphics printing capabilities, then you need to look at laser printers in a much, much higher range. As it is, the graphics and image output of the Oki C531DN is only good enough for internal use. In fact, if you’re thinking of printing your annual reports or PPTs for the sake of your clients or investors, then our advice to you is simple: don’t, the quality isn’t enough. If the dimensions of the OKI C531DN fall in the strengths category, its weight definitely falls in the weakness category. Despite being compact, this printer can be incredibly cumbersome and tedious to pick up since it weighs a sizeable 22 Kg, which is just beyond the “pickable” range for a standard human being without the risk of injury. The monthly duty cycle of the OKI C531DN actually reflects its workhorse nature. This printer is rated at a monthly duty cycle of 60,000 sheets. However, with a workhorse printer you also need to look at the running costs. The C531DN is definitely cheaper than C33DN. At the same time, it isn’t that much ahead of its competitors at 16.2 cents per page but that is with genuine cartridges. If you use generic cartridges, though, your running costs will drop by around four cents per page to approximately 12 cents per page. 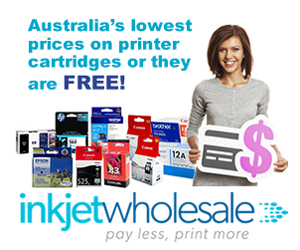 You can find highly reliable toner cartridges with us, at Inkjet Wholesale, of course. We mentioned earlier in this post that options within the software of this printer are decent. We feel compelled to add now that the control panel i.e. the physical buttons on the hardware are not as elaborate. You can make of this what you will because some people like more buttons to press while others prefer to avoid pressing buttons altogether. All puns not intended. The control panel is dominated by a five button circular control setup with a separate back button. This is complemented by a 50.8mm LCD screen capable of displaying 32 alphanumeric characters spread over two rows. The standard internal memory of the Oki C531DN is 256MB but that can be upped to 768MB. The maximum resolution that this printer is capable of is 1200 x 600 dots per inch (dpi), which is actually higher than most of its competitors. Since there is no Wi-Fi direct facility, the printer offers the usual Ethernet and USB 2.0 facility in the connectivity column.